In what may be his last fight at middleweight, IBF champ Arthur Abraham clashed with tough challenger Mahir Oral last night in front of 7,000 fans at Max Schmeling Halle in Berlin, Germany. Oral, a former sparring partner of Abraham's, showed that he was well acquainted with the style of the champion in the early going, peppering Abraham with jabs and combinations that didn't seem to have much effect other than winning the rounds for Oral. Abraham was slower than usual in warming up, perhaps conserving whatever energy he had left following his efforts to continue making 160 pounds. But "King Arthur" awoke at the end of the fourth stanza to blitz the challenger to the floor with heavy artillery but he couldn't finish off Oral. Abraham continued his shelling of Oral in the fifth and sixth frames, an unstoppable powerhouse that was simply chewing up the challenger, who again had to climb off the canvas. 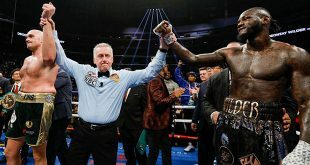 Oral somehow survived the pounding and returned to form in the seventh when Abraham had to take a well-earned breather but he wasn't able to hurt or even shake the champion. Abraham resumed coming forward by the eighth and steadily began reducing the resistance of Oral, who could not stop the steamroller in front of him no matter what he hit Abraham with. The challenge of Oral fell apart in the tenth when he had to take a knee twice before Abraham finished him off at 1:23 of the frame when Team Oral threw in the towel. Mahir Oral, 25-2-2 (10), is stopped for the first time in his career during a brave but unsuccessful bid to lift the IBF title from Arthur Abraham, who improves to 30-0 (24) and keeps his belt for the tenth time. 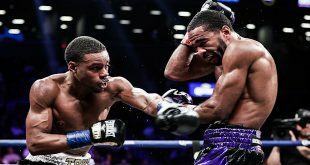 The supporting bouts in Berlin featured Sebastian "Hurrikan" Sylvester, 31-3 (15), outpointing iron-chinned American Lajuan Simon, 21-2-2 (12), over 12 competitive frames for the IBF International belt and Italy based Sierra Leone southpaw Leonard Bundu, 19-0-1 (6), retained the European Union welterweight trophy with a hard fought decision over previously unbeaten Frank Shabani, 17-1 (6). 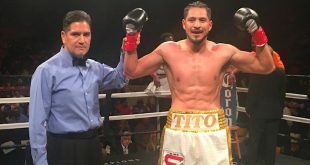 Cruiserweight Enad Licina, 17-1 (10), outpointed Ignacio Esparza, 14-1 (10), for the IBF Intercontinental title.